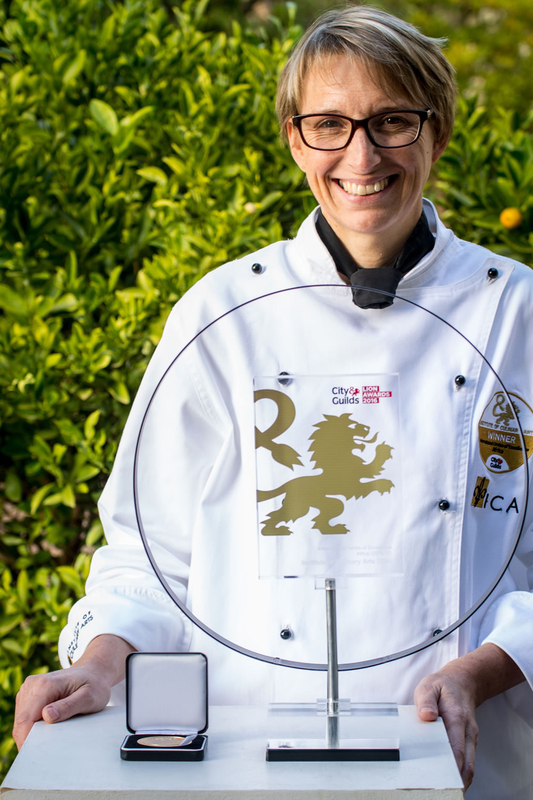 The Institute of Culinary Arts (ICA) is once again taking the lead in the South African culinary arena, being the first ever chef school to receive not one, but two Interntational Medals for Excellence! Known as the country’s foremost school for professional chef’s education, the ICA, located in the beautiful Banhoek valley in Stellenbosch, celebrates 21 years of training excellence in the wake of receiving global recognition by one of the world’s largest vocational authorities, City & Guilds of London. The ICA is rated as an International City & Guilds Centre of Excellence, the first and only South African tertiary education facility to ever receive this award! It is therefore even more remarkable that a second gold medal was awarded to this prestigious chef school, when City & Guilds recognized the exceptional training offered by the ICA, through awarding current Head of Faculty and Senior Pâtisserie lecturer, Chef Merizle Mitrovich, with a City & Guilds Medal for Excellence as Tutor of the Year! Merizle joined forces with the ICA 20 years ago and due to her unfailing commitment to the ICA’s training ethos, she has now received this prestigious recognition, adding yet another highly acclaimed praise to the ICA’s already exceptional list of accolades. The Institute of Culinary Arts truly is South Africa’s most highly awarded chef school! Excellence in training is certainly evident in the achievements of proud ICA alumni. ICA-trained chefs have for many years dominated the SA Eat Out Best Restaurant lists – more than 20 ICA qualified chefs counted in the top awards over the past five years – an achievement not nearly equaled by any other training facility in the country!